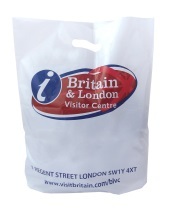 The lowest price for printed carrier bags on the web. Simple, fast and cheap - get a quote in 60 seconds! 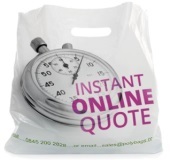 Get a quote in 60 seconds on printed carrier bags, 24 hours a day, seven days a week. You won't find that service anywhere else online! Give your mail a stamp of professionalism with your very own printed mailing bags. Get an instant online quote today! If you don't need printed carrier bags, then take a look at this massive range of carriers available off-the-shelf. 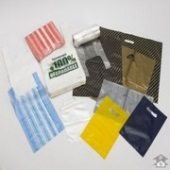 Discount Carrier Bags is a division of Polybags, the UK's number one manufacturer of polythene packaging. If you require any advice or assistance regarding our range of discount carrier bags or our printed carrier bag service, please complete the form below and a member of Polybags' first class customer service team will contact you at a convenient time. Please note our callback service is only available during regular UK office hours (9am - 5pm Monday - Friday).